This Easter Menu is proof: Spring has sprung! Welcome the new season with a centerpiece of colorful blooms on your table and enjoy this easy Easter dinner. Mix all ingredients and pour into glasses over ice. Garnish with an orange slice. hisk 4 tablespoons oil, lemon juice, oregano, and scallions into the orange juice, season with salt and pepper, and set aside. Snap off the tough ends of asparagus and discard. 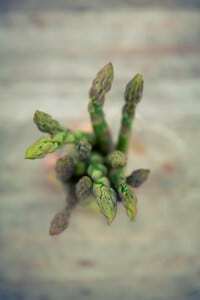 Arrange the asparagus in a single layer on a microwave-safe plate and top with 1/2 of the orange zest. Drizzle with remaining 2 tablespoons oil. Cover asparagus with plastic wrap and microwave on high for 2-3 minutes, rotating dish halfway through, until asparagus is just tender. Uncover and drain. Toss asparagus with citrus dressing and season with salt and pepper. Top with orange segments. Serve warm or at room temperature. ge pot, melt the butter over medium heat. Add the onion and sauté until softened. Add rice and stir for several minutes. Add 1 cup stock and cook over medium-high hear stirring occasionally until absorbed. Repeat with 2 more cups of stock. Stir often to prevent the rice from sticking to the bottom of the pan. Add peas and the final cup of stock; cook for 3-5 more minutes until the rice is tender. 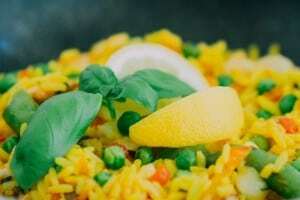 (The rice should be saucy and al dente, not watery or mushy.) Add the grated Parmesan and season with salt and pepper. Orange-glazed ham steaks are an easy-to-make entree on your Easter Menu. In a small bowl whisk together the sugar, cornstarch and hot water until the granules dissolve. Add orange juice, vinegar, and zest. Pour into saucepan and heat on medium- high; stir until sauce is thickened (2-3 minutes). Grill or sauté ham steaks on medium until heated through and nicely browned on edges (5-8 minutes). 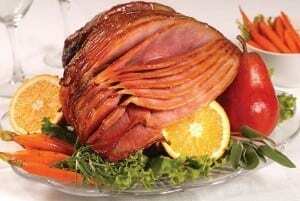 Serve ham drizzled with orange glaze and garnish with orange segments or slices if desired. Combine butter, sugar, vanilla, and food coloring if tinted cream is desired; mix well until smooth and firm. Chill for 30 minutes. Use a teaspoon to shape into small oval eggs and chill for an additional 15 minutes. Melt chocolate on low (20% power in the microwave for several 10-20 second intervals or low heat on stove top). Pierce the cream egg with a toothpick and dip and swirl gently in the melted chocolate. Top the egg with a sprinkle of sea salt or dip in shredded coconut or colorful sprinkles. Chill to set. Makes 40 small eggs.